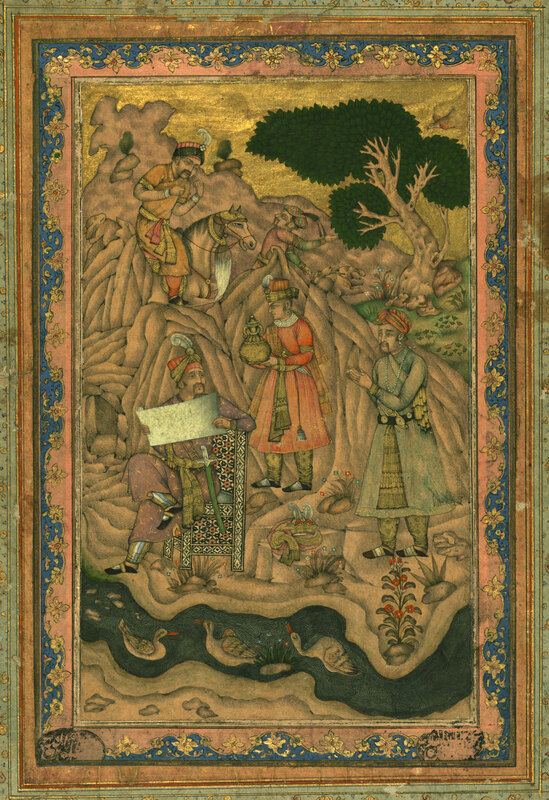 This painting depicts a Mughal emperor, yet to be identified, seated in an inlaid chair of European design, on the bank of a brook in a rocky landscape. He is reading an unrolled document which may have been presented to him by the figure standing to his left. The standing figure bears some physiognomic resemblance to portraits of the Mughal emperor Akbar (r. 963-1014 AH / 1556-1605 CE). On the ground between the two figures is a crown and garment. A figure on horseback makes the gesture of surprise in the background. The painting was executed in India during the twelfth or thirteenth century AH / eighteenth or nineteenth CE. The polychrome floral borders surrounding the image are not much later than the image itself.